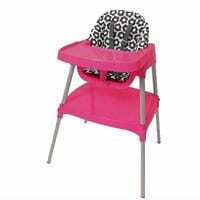 Evenflo Inc. convertible high chairs have been recalled by the CPSC. The activity tray on the high chair can unexpectedly detach and allow an unrestrained child to fall, posing a risk of injury to the child. There have been 19 injuries reported with the recalled high chair so far. The recalled Evenflo product converts from a high chair to toddler-size table and chair. The convertible high chair has the following model names and numbers, located on a label on the lower portion of one of the high chair’s legs. About 35,000 of the high chairs were sold nationwide in the United States between December 2011 and June 2012 for about $40. Consumers with the recalled high chairs should immediately contact Evenflo for a replacement tray on (800) 233-5921, or visit http://safety.evenflo.com.